Antimicrobial peptides (AMP) are a diverse group of biologically active molecules with multidimensional properties. In recent past, a wide variety of AMPs with diverse structures have been reported from different sources such as plants, animals, mammals, and microorganisms. One of the system present as the first line of defence in the innate immune system are AMPs. 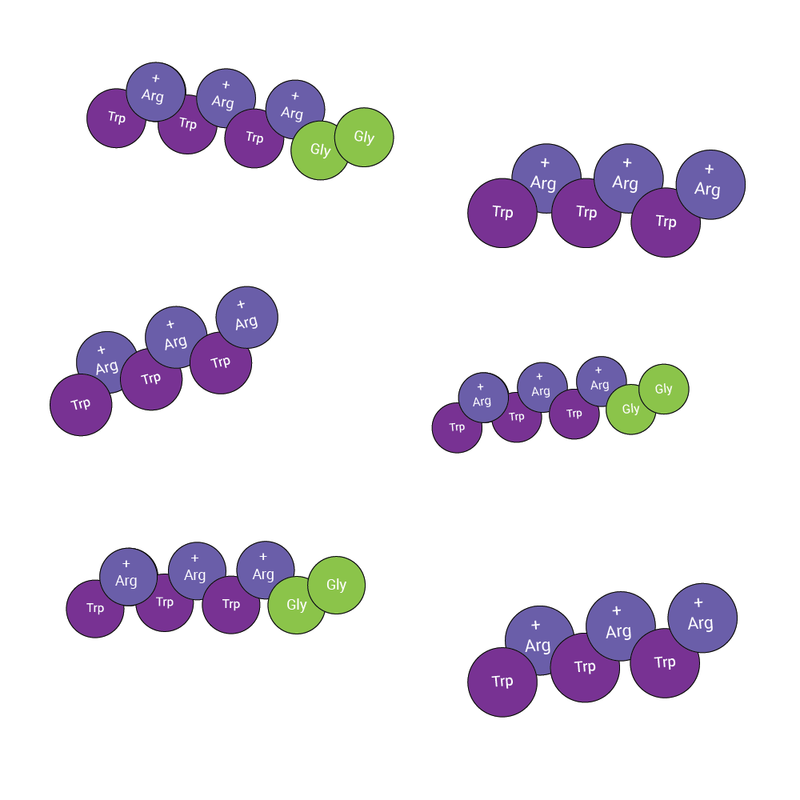 Antimicrobial peptides range in length from four to more than 100 amino acids and fall into a number of different structural classes, including -helical amphiphiles, lipopeptides, glycopeptides, lantibiotics, and short cationic peptides (Wenzel et al, 2014). The short cationic peptides offer a potent alternative to longer natural antimicrobial peptides. The unusual composition of regular amino acids of particular interest are peptides with a high content of tryptophan(Trp) and arginine(Arg) residues, as these residues represent a recurring theme among many antimicrobial peptides and almost always play important roles for activity. 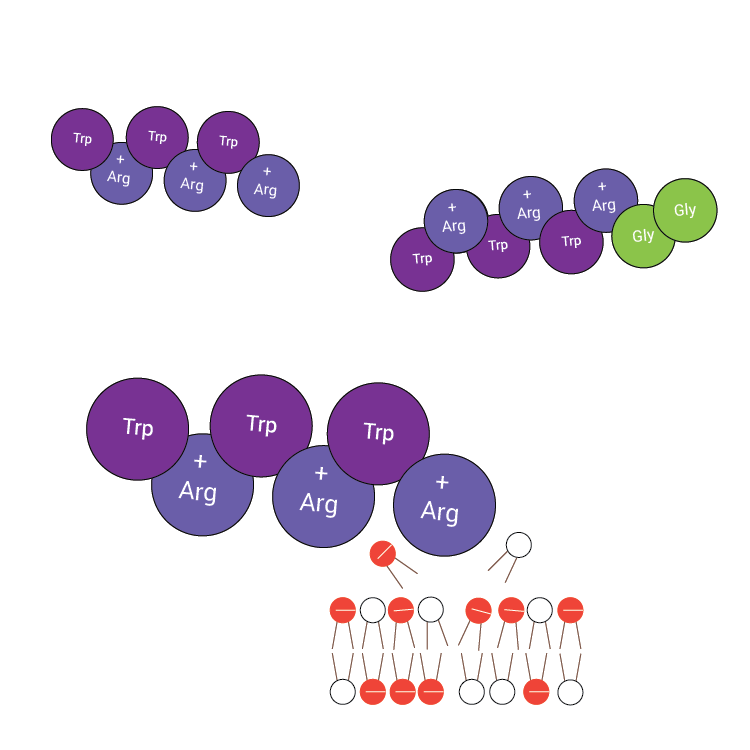 Further testament to the significance of Arg and Trp residues is the fact that upon screening of a complete combinatorial library of hexapeptides, peptides rich in these two amino acids were found to possess the highest antimicrobial activities. Trp and Arg rich peptide displays promiscuity against pathogenic targets due to the properties of these two residues. Overall, because of their many advantageous properties, it appears that Trp and Arg residues are exceedingly suitable to contribute to potent antimicrobial agents that eventually may be used on humans. It is effective against gram-positive bacteria including Methicillin Resistant Staphylococcus aureus strains, is moderately effective against gram-negative bacteria, and displays low hemolytic activity on cell lines (Chanet al, 2006). Trp has a distinct preference for the interfacial region of lipid bilayers, while Arg residues endow the peptides with cationic charges and hydrogen bonding properties necessary for interaction with the abundant anionic components of bacterial membranes. In combination, these two residues are capable of participating in cation–πinteractions, thereby facilitating enhanced peptide–membrane interactions. Trp side chains are also implicated in peptide andprotein folding in aqueous solution, where they contribute by maintaining native and non-native hydrophobic contacts. These unique properties make the Arg- and Trp-rich antimicrobial peptides highly active even at very short peptide lengths. The cationic hexapeptide RWRWRW-NH2 acts on thebacterial cytoplasmic membrane by integrating into the lipid bilayer. This membrane integration likely is promoted by the interaction of the cationic Arg residues with negatively charged phospholipid head group and is facilitated by lipophilic Trp residues. The integration into the membranes affects multiple cellular process; the inhibition of the respiratory chain by the peptide is caused by the detachment of cytochrome c from the membrane, resulting in disruption of the electron transfer chain and subsequent breakdown of the proton gradient. Inhibition of the respiratory chain then affects ATP synthesis, causing energy limitation that impacts all other macromolecule biosynthesis pathways. Substantial energy limitation and loss of cell wall integrity are the major factors that contribute to bacterial cell death (Wenzel et al, 2014). But, the presence of arginine residues at the N – terminal of a protein greatly decreases its half-life according to the N – end rule. In order to test for such a possibility, two glycine residues were added next to methionine at the N – terminal. The AMP – WR1 consists of 3 WR repeats and WR2 is the same as WR1 with a couple of glycine residues. 1. Michaela Wenzel et al,(2014) Small cationic antimicrobial peptides delocalize peripheral membrane proteins, E1409-E1418; DOI 10.1073. 2. Chan DI et al (2006), Tryptophan- and arginine-rich antimicrobial peptides: Structures and mechanisms of action. Biochim Biophys Acta 1758(9): 1184–1202. 4.Rathinakumar R et al, (2009) Broad-spectrum antimicrobialpeptides by rational combinatorial design and high-throughput screening: The importance of interfacial activity. J Am Chem Soc 131(22):7609–7617.